Monday morning is here and I’m hoping everyone had a wonderful weekend! As I’m sitting here drinking my coffee and thinking about my day yesterday, I’m realizing that it was one of those really lovely days where we didn’t really do anything particularly special, but the whole day added up to one that was in fact special. As my boys are rapidly getting older, these days are so important to me as I know sooner rather than later, they will likely want to be with their friends more than they will want to hang out with Mom and Dad. I’m OK with that, I mean it doesn’t exactly make me sad as I truly love to watch them grow and become their own people. I guess I just feel that it’s the natural order of things. Nonetheless knowing these days are somewhat numbered, I cherish them so so much. Yesterday was my one day of the week to sleep in. I had grand hopes of sleeping until at least 9:00AM. I was dreaming, and not the way I wanted to be dreaming, because I was wide awake at 6:45AM and my body refused to go back to sleep. Sure, I complained about it, but really, my kids were up and playing so nicely together. What better noises could I be listening to on an early Sunday morning? My husband was in the same boat as me, so he started playing his video game while Pepperoni was hanging out with me. As my man was killing bad guys, he was also (relentlessly) requesting steak and eggs for breakfast. The night before I tried out a new recipe for delicious Surf & Turf Cajun Pasta and we had just enough leftover steak for everyone to have a nice breakfast. Seriously…YUM!! 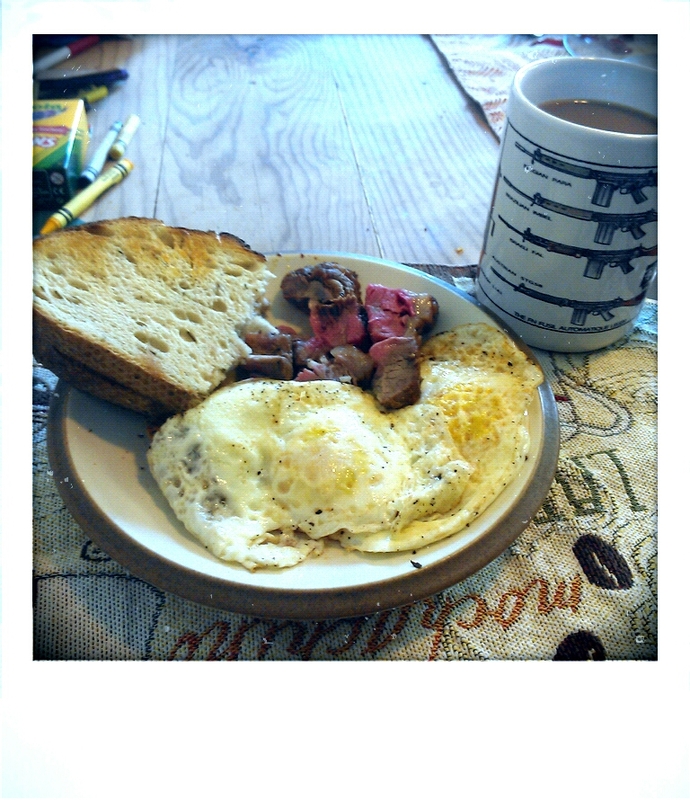 Not getting to sleep in has it’s advantages, like cooking a bomb breakfast and having the dishes done all before 9:00AM. After I refilled my coffee mug, I crawled back under the covers and settled down to some crochet. The whole time I was listening alternately to my favorite Country songs (I’m on a bit of a Country music kick at the moment) which my husband hates yet tolerated for me and to my boys giggling and laughing and playing with their Daddy. 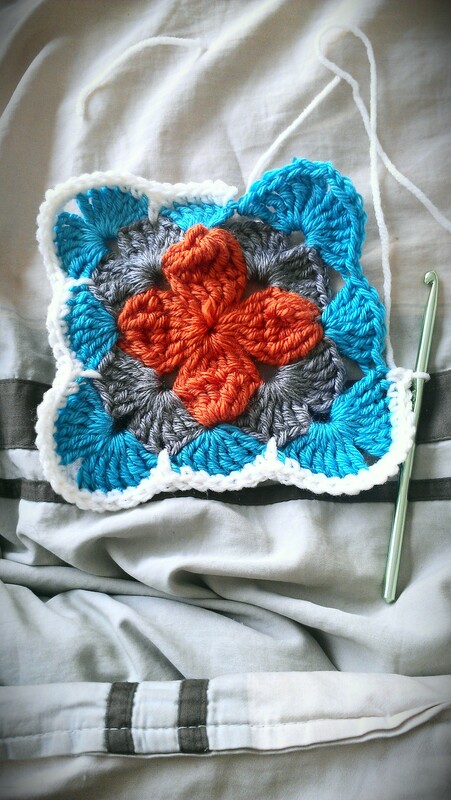 Yesterday I shared a photo of the square I worked on and I think it’s turned out very pretty. Not sure yet what I am going to make with it, as it is much larger than I expected. Maybe I will make it with a smaller hook and see if that suits my needs. This motif is from the Weekend in Stockholm Throw from Stitch Nation. Love love love! After some lunch, we all went to our association pool and spent a few hours in the water. I got to lay out and read my book in the sun while watching my boys rough house with my man in the pool. I’m reading the first book from A Games of Thrones. I feel like I have been reading it forever, but I really am enjoying it. I am more inclined to crochet lately than to read and I think part of that is because I have already watched the show and know what’s going to happen in the book. But I love how closely the show has followed the book, as that never seems to happen! After a bit, I jumped in the water, too, and we all had a blast. The boys sacrificed me a few times to The Shark Monster AKA Dad to save themselves, but I won’t take it too personally! I was also told that I was their vehicle and to go faster as we were “swimming” away from said monster. Swimming away consisted of me carrying a 4 year old on my side and an 8 year old on my back and trying to stay afloat. Finally it was time to go home and get dinner started. 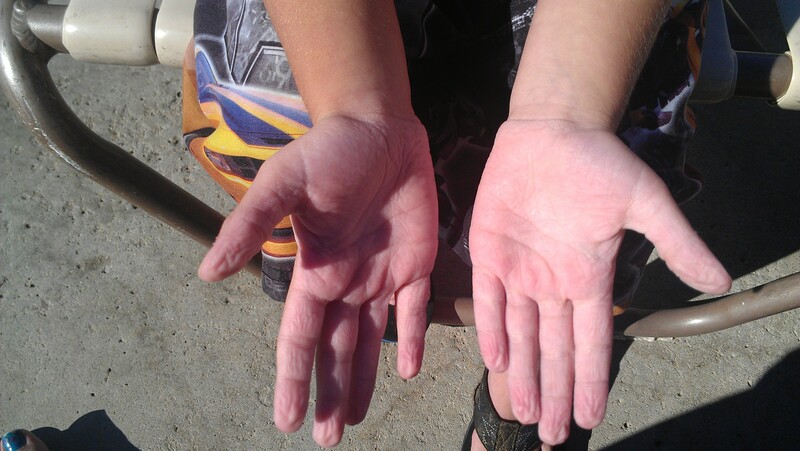 We were in the water so long, C had little old man hands. He kept saying “Look, I’m an old man! !” in the silliest little old man voice! When we got home, my man fired up the coals for the BBQ and I cut up some fixings for burgers and Italian sausages for dinner. Food always tastes so good after you’ve been swimming in the sun all afternoon! Next we let the boys pick out some candy and settled down on the couch with the dog and cat to watch a movie. C quickly fell asleep, so we put him in bed and turned on Super 8 for the rest of us to watch. T has been wanting to watch scary movies lately and this was a really good one for him. 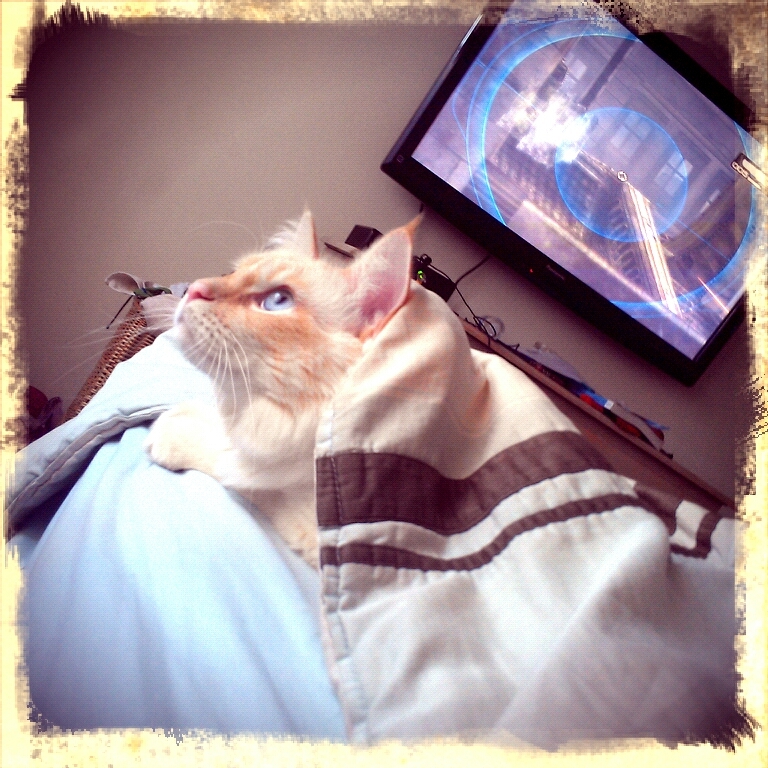 It was definitely not a little kid movie but it wasn’t too scary for him either. All in all, it was just a perfect day. We just did what we wanted, when we wanted. There no fighting between the kids and we just got to really enjoy them. Now that it’s Monday and we’re all back to the grind, I’m so glad we had a day to just chill and be a family without having to follow all the strict schedules of work, school and sports that we have to stick to for the rest of the week.